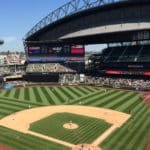 It’s hard to think of summer in Seattle without taking in a baseball game at Safeco Field, home of the Seattle Mariners. Our temperate summer weather and the stadium’s special amenities make sitting outside at a ballgame pleasant and enjoyable, even if the team is not winning! Safeco field opened in 1999 and since then it has become a Seattle icon. One unique feature is its retractable roof. This special roof maintains Safeco Field’s open-air environment. Most of the time the roof stays open, but it can be easily closed if the rain starts coming. The roof closes in about 10-20 minutes, depending on the wind and weather conditions. Even when the roof is closed, many upper-level seats and concourses offer stunning views of the Seattle skyline and Puget Sound through the open sides. This beautiful stadium is filled with baseball-themed art. One of the most famous is a chandelier of 1,000 translucent baseball bats hanging above the staircase at the Home Plate Gate. Right outside the gate is another well-loved piece of art called the MITT, a giant cast bronze sculpture of an old-fashioned catcher’s mitt. Be sure to come hungry to the stadium, as Safeco Field is famous for its great food and variety of choices beyond the typical hot dog. Options include fish tacos, Dungeness crab sandwiches, famous garlic fries, and much more. Naturally, there are also a variety of local wines and microbrews on tap and great Seattle coffee too. Many visitors wonder about transportation and parking. It’s easy to take the bus or the Sound Transit LightRail to Safeco Field, but if you drive there is garage parking, street parking, and many paid lots available around the stadium. Prices range from $5 to $40. You can make a parking reservation with Parking Panda At this time, baseball tickets are usually still available on game day or just prior. Check out ticket specials, special events, and Safeco Field Tours on the Mariners website: See you at the game!